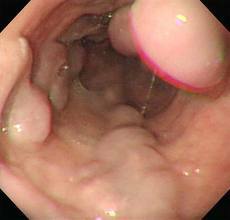 Esophageal varices refers to dilated, tortuous mucosa or sub-mucosal esophageal veins. Portal hypertension is the main cause of dilatation of esophageal veins. Portal hypertension is due to hepatic cirrhosis of any origin. Increased pressure in the portal vein results in opening of collaterals veins between portal and systemic venous system. Dilated esophageal veins may rupture and show clinical signs and symptoms. In un-ruptured condition there will be no clinical symptoms. when rupture the patient present with hemetemesis, esophageal laceration, peptic ulcer, 40 % patients die during the first episode of hemetemesis. Treatment of Esophageal varices in patients who have no history of esophageal bleeding. 3. Endoscopic seclerotherapy and variceal ligation is effective treatment to prevent bleeding. 4. Combined therapy: that is with endoscopic seclerotherapy and betablockers. 1. Asses the rate and volume of bleeding, check blood pressure, pulse. take blood sample of the patient and send it for cross match and hematocrit measurement, liver function test, platelet count, PT and APTT. 1. Monitor blood pressure, pulse respiration and heart rate. 2. Establish and maintain and intravenous line for blood transfusion. If blood is not available or it is being cross matched start 5% dextrose and colloid infusion until the blood pressure and adequate urine output is restored. 3. Establish air way protection in patient with massive upper GI bleeding, especially if patient is unconscious. 4. If indicated, correct clotting factor deficiencies with fresh frozen plasma, fresh blood, and vitamin K-1. 5. Insert a naso-gastric tube to asses the volume of bleeding and perform a gastric lavage before sending the patient for endoscopy. 7. . Endoscopic therapy probably has replaced balloon tamponade as the initial therapy for variceal bleeding. Balloon tamponade is now rarely necessary, and, when it is used, it must be performed by experienced personnel because the procedure is potentially dangerous. 8. and finally endoscopic seclerotheray and variceal ligation.